If you’ve spent any amount of time reading blogs online or flipping through a brochure, you’ve no doubt noticed that the things that catch your eye first are usually images. 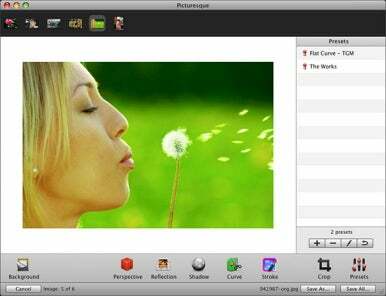 If a picture is worth a thousand words, then Acqualia’s Picturesque 2.0.3—a simple image editor designed to let you take ordinary images and make them beautiful—is a pocket thesaurus. Because its goal is so simple, Picturesque isn’t bogged down with scads of features few users will use; it doesn’t try to be Photoshop Light. Instead, Picturesque focuses on a few key effects and on providing great results with ease. Bloggers in particular may find that Picturesque is all they need to quickly create stunning graphics for their online endeavors. Working with Picturesque couldn’t be easier. You simply drag your image, or a folder of images (if you want to apply the same effects to multiple images), into the program’s drop zone or onto its Dock icon to have the image(s) displayed in the main editing window. 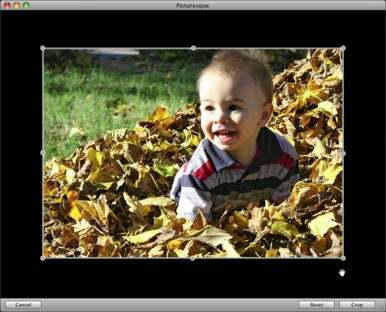 Alternatively, an OS X Media Browser allows you to select an image from any of your iPhoto albums or from your main iPhoto library. Picturesque is a single-window program, so opening multiple images presents you with thumbnails of those images at the top of the window, allowing you to quickly switch between them with a click of the mouse. Unlike with some other image editors I’ve tested, Picturesque is fast: I dragged a folder full of high-resolution images into Picturesque and the programed quickly opened them in the main editing window. Once your images appear in the main Picturesque window, you can begin adding design elements to them. Picturesque features five distinctive and popular effects, accessible via a few simple buttons and sliders. If you've opened multiple windows, effects are applied to all images simultaneously. Perspective Using two sliders, you can easily add rotation and elevation (skew) to your image, giving it a nice 3-D effect. Reflection Three sliders allow you to adjust the length, opacity, and offset of a beautiful surface reflection, similar to the ones you see in Apple’s iPhoto slideshows and Mac OS X’s Cover Flow feature. Curve If square photos aren’t to your liking, this effect lets you apply a curve to any of your image’s corners by simply clicking on a checkbox for each corner. A slider lets you choose the curvature, from 0 to 1050 pixels. Stroke Makes it easy to add a stroke (a border) around your image. You can choose to have the stroke appear on the inside of your image’s edges, around the outside of its edges, or centered on the edges. You can adjust the width of the stroke as well as choose its color. You simply click on one of the five effect buttons to access its settings; click on the effect’s name to apply it to, or remove it from, the image. Each effect is applied in real time, and even with large, high-resolution images, the preview is updated fluidly. This ability to quickly view your image with and without a given effect is one of my favorite features, as it allows you to experiment with different effects without having to undo or start over. Another nice feature, added in version 2.0 as a result of reader feedback, is the capability to crop your image. The crop tool works as you would expect, allowing you to grab “handles” around the image and move them to choose the crop area. You can also move the image within the crop area by clicking and dragging inside the crop handles. Once all your effects are in place, a Presets button allows you to save the various settings for later use with other images; saved presets appear in a Presets list you can display at the right side of the window. Presets are especially handy for bloggers who want to maintain a consistent look for their images. After you’ve finished tweaking your image, you have just a few more choices to make. Clicking the Background button allows you to quickly choose a black, white, grey, or custom color background for your image. The Save As button (Save All, if you’ve applied effects to multiple images) brings up the familiar Mac OS X Save dialog. From there, you have the option of JPG, TIFF or PNG file formats; if you choose PNG, you also have the option of applying a transparent background (overriding any custom background you previously applied). Regardless of the format, you can choose the final dimensions of the saved image. My complaints about Picturesque are few. For one, the Picturesque window’s background color makes it difficult to see the shape of your image(s) when using the Perspective, Reflection, or Shadow effects; for example, if opacity is set too light, it’s a challenge to see just how far down a reflection goes. A small keyline around the actual image area in the main window would be a nice improvement. Another minor issue is that the Crop tool is applied to the original image, not the post-effects image. Finally, it’s sometimes difficult to achieve the exact setting you want using the program’s various slider controls; a numerical-entry box next to each would go a long way towards solving this problem. 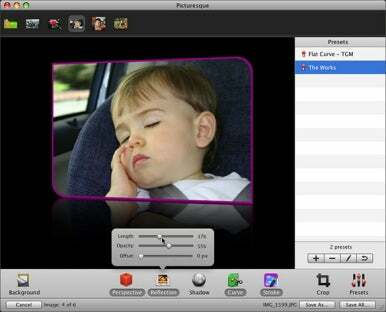 Back in 2007, an earlier version of Picturesque was awarded Best Mac OS X Student Product, and once you use the program, it’s easy to see why. While Photoshop or any of a number of other image editors could produce the same results, few (if any) can do it with the ease of use or speed that Picturesque can. For bloggers or home users who simply want to get their pictures “out of the box” without a learning curve, Picturesque is about as good as it gets. James Dempsey runs The Graphic Mac, which offers tips, tricks, and more for Mac OS X and the Adobe Creative Suite apps.